Signing up to an email marketing service provider is a big commitment in terms of cash; too big for many. The beauty of running a WordPress blog is that there are free and low-cost plugins for everything. There are dozens of email marketing plugins that can instantly get your site ready to go. Unlike a one-size-fits-all solution, plugins are used to fill specific needs wherever you find them. They give you the flexibility to customize your site to your near-exact specifications. While this can be extremely cost efficient, a bundle of plugins can sabotage your site’s load speed, which is a MAJOR marketing no-no. Premium plug-ins can be better but you can still run into server and deliverability issues. Most website owners host using shared servers with limited resources. You will only be able to send out emails very slowly on these servers. You will find your web host may become unhappy about the server resources you are using and will probably ask you to upgrade to a VPS or dedicated server with more processing power. You can learn more about the various types of hosting here. On a shared server, you share an IP address with other sites hosted on that server. If one of the other websites has tried sending out emails before, the IP address may have already been flagged as a source of spam, so your important messages will go straight to spam folders and never be seen, let alone opened. Segmenting a list based on location, previous email actions etc. When you look at the list of tasks that an email management service (EMS) must handle, you start to understand the difficulty in a DIY, multiple plugin approach. When you add in image libraries, templates and support, EMS charges can look very reasonable. You need every one of these features, especially the ability to analyse what happens to the emails you send. Without that information, how could you ever improve your emails? If you cannot measure your results, it is impossible to improve on them. Without analytics you have no segmentation or split-testing capability, and you lose the ability to make your emails more effective. 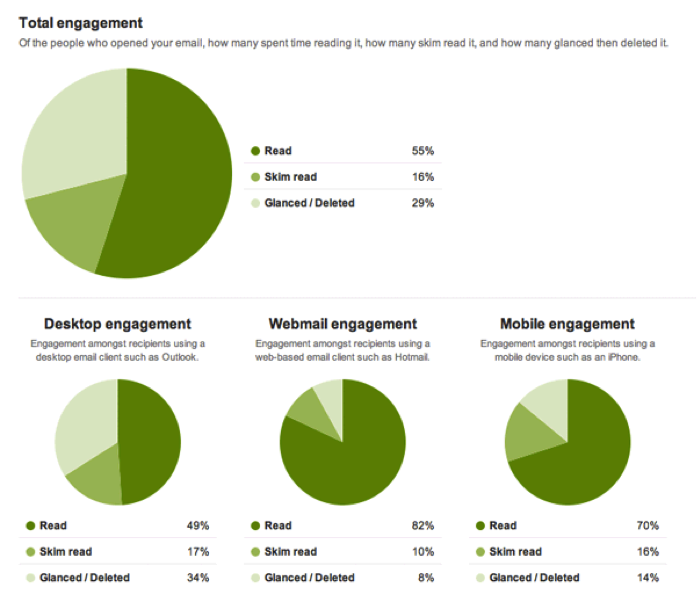 Email analytics is more than just numbers. A good analytics dashboard means you can make decisions without looking at any complex statistical analysis: Everything is done for you and presented in simple to understand graphics. In the example above (taken from GetResponse), you can see how easy the typical email management service analyses are to understand. You can see how effective a campaign is just by looking at the charts. A/B testing, also known as split-testing, can produce a massive impact on your bottom line. It can mean the difference between a roaring success and an abysmal failure, yet many site owners have yet to bother with testing their sites. The difference each split test makes might only be 5%, but if you run 100 split tests on the same email and each makes a 5% difference, your overall results will be 131 times better (1.05100). When utilizing an EMS provider that incorporates a good AB testing interface, obtaining these results is a much simpler process than when using WordPress plugins. Email analytics mean you can segment your subscribers on the basis of their reactions to your previous emails. You can gradually move those who take action further down your conversion funnel. We are all seeing more and more marketing emails in our inboxes, which means it’s becoming more and more difficult to stand apart. Segmentation allows you to target specific groups of people based on what will be most compelling to them. WordPress plugins are great for many, many marketing purposes. Attempting to ‘MacGyver’ an email marketing system using plugins, however, is simply put, a bad idea for most users. From the time it takes to DIY, to the extreme server limitations, to the drain on site speed, to the lack of important features like testing and segmentations, it’s more than worth it to use a dedicated system for email purposes. SitePoint has an entire Entrepreneur category which regularly covers email marketing, which I’d highly recommend checking out. Furthermore, email marketing is easily the biggest money maker for most online businesses. It’s important to do it right. What do you think? Have you had success using WordPress marketing plugins? What problems did you encounter? Please share your experiences in the comments below.